Cut the white cardstock to size 150x250mm, fold it in half and flatten the edge with a bone folder. Place the tree as well as the border die together on your base plate. Stick them down with cello tape to prevent them moving while you cut. Use the off-cut of the white cardstock and cut the tree, take care when you remove the paper from the die. With this die in particular it is essential to use wax paper to cut it. It is also necessary to shim the cutting edge of the die with another piece of cardstock to ensure smooth cutting. The branches of the tree are very fine and less than a millimeter in width so it tears easily if you remove it from the die without using the wax paper. Use the outside frame and place it on the patterned blue paper so that there is dark color at the top and cut it out. Often one needs another mount for the object you have just cut, but the die set lacks another nesting die to achieve this. Simply use the outer edge of the biggest die you have and trace around the edge with a pencil on the wrong side of the paper and cut it out by hand. Ink around the card edge with blue and stamp a sentiment in the open space on the card if so desired. To finish off your card use the dimensional glaze and the Pick-up-Tool to adhere the pearls to your tree branches. Use alcohol inks to change the colour of your white pearls to suit your project. Place the pearls on a craft sheet facing upward. Drop a tiny droplet of alcohol ink on top and let it dry thoroughly, this technique also works with gemstones. Cut the white 12×12” paper down to 305x155mm. Score both sides (the 305mm length) at 75mm or simply fold both inward to join up exactly in the center of the card. Flatten the edges with a bone folder. Due to the fact that the durable paper used in this project is made from cotton, the sides will not crack open when you flatten the sides. Take the red paper and trim it down to A4. Insert it into the M-Bossability and run it through your Grand Calibur then cut a rectangle of 140 x 150mm out of the red paper. Trim this in half to 70 x 150mm (NB: MARK BOTH PIECES AT THE TOP : LEFT & RIGHT SO THAT YOU KNOW HOW TO STICK THEM DOWN ON YOUR CARD TO ENSURE THAT THE PATTERN JOINS UP CORRECTLY) Use good quality double-sided tape and adhere both red pieces on top of the flaps of your white card. Tip: A great tip when cutting dies with fine detail is to use wax paper (the kind you would use for baking in your kitchen). If you remember the Afrikaans saying: “hou die blink kant bo” you cannot go wrong. Place the wax paper with the glossy wax side away from your die, thus facing the paper. The function of the wax paper is for easy removal of the die-cut shape and to prevent the paper from tearing when you remove it from the die. Fasten the 3 nesting heart dies together. Use either a piece of cello tape or stick them down with double-sided tape onto your base plate. It is imperative that the dies are unable to move around when you cut. Cut the 3 heart shapes simultaneously from first the white offcut you will have left and then from the silver paper. 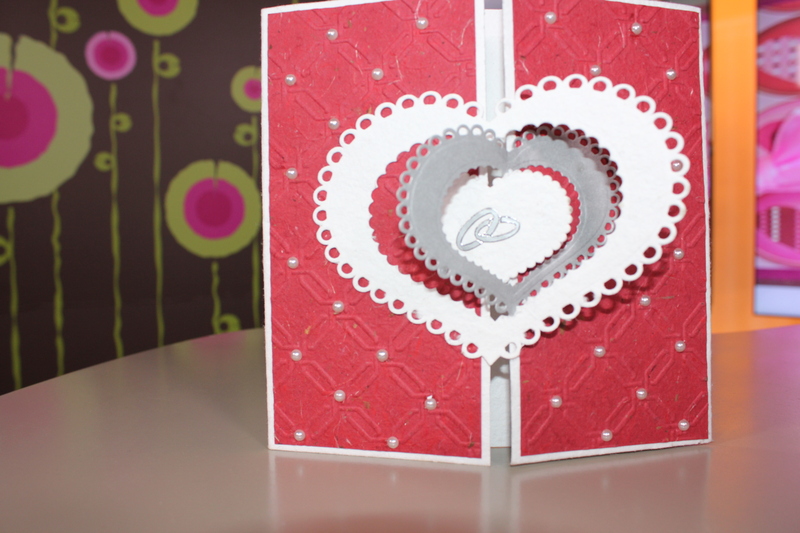 Use the largest heart shape (white) and space it over your card in such a way that there is ample space to add the pearls later to the red background. Adhere it to the card ONLY on the left side. Leave the right side unattached. Take the second piece (silver) and position it inside the white and adhere it ONLY to the right side of the card. Then place the small central heart (white) inside the silver and again ONLY adhere it to the left side of the card. You have now created a beautiful interlocking mechanism for your card. Lastly use the dimensional glaze, the Pick-up Tool and adhere the pearls to the front of the card on the red embossed paper.